Newbie Type 4 question here - are the exhausts interchange post exhaust manifolds that come from the heads? Assuming that the total flow would be based on the displacement? The exhausts are interchangeable as a unit. The heat exchangers, muffler, and muffler hanger must match, but they don't care which version of the 914 engine they go on. There were three factory versions of the exhaust: The 1.7 version (which was also used on the 74 1.8s), the 2.0 version (73-74 2-liters), and the late version (used on all 75-76 914s, both 1.8 and 2 liter). The late exhaust is the only one that has a separate "header" piece that bolts to the exhaust ports, both earlier versions have the header and heat exchanger as a single part. Note that the heater stuff that bolts up to the exchangers will swap between the 1.7 and 2.0 versions of the exhaust, most the late style heater bits only bolt up to the late style exhaust. Thanks Dave - very helpful! My exhaust tip is about the size of a Starbucks straw which is what triggered the question but I’m not sure what is actually connected othe engine. 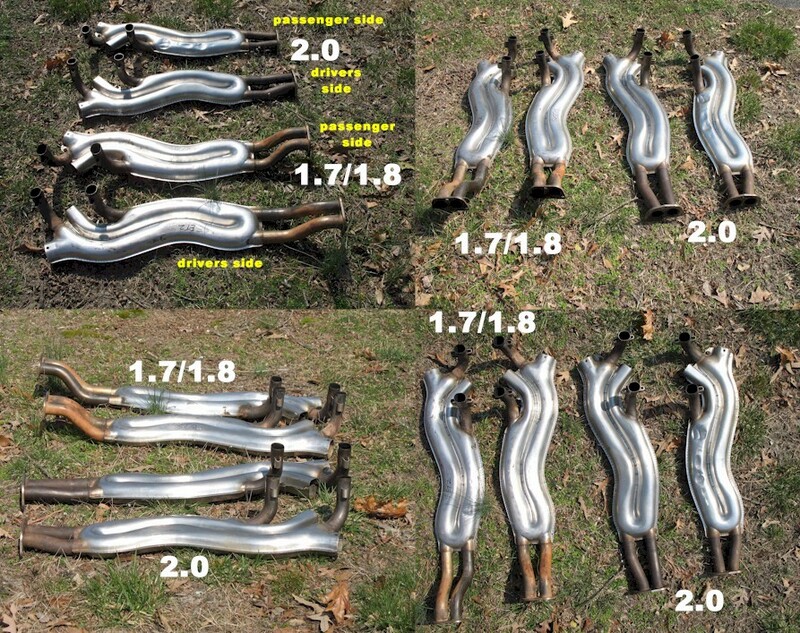 The 1.7/1.8 vs 2.0 SSI they both are the same size tube so flow the same. Stock muffler the 2.0 is the clear winner, but can only be used with the 2.0 exchangers. 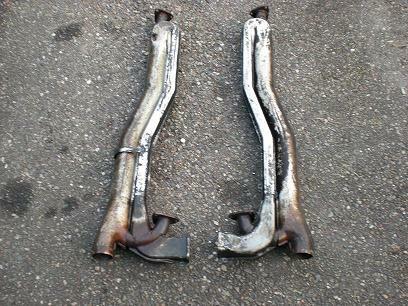 All things being equal with a similar aftermarket muffler/header, they'll be the same as far as flow/HP numbers. Good morning, thanks for the follow up. It’s entirely possible that someone just put a super small exhaust tip on a correct set up, but my guess is that the muffler is undersized for the 2 L in it it. Ultimately, I suppose, the exhaust gases need to get out of the exhaust tip so if that’s undersized the whole system will be compromised . A better question Skip, would be why the heck would anybody want 1.8 heads on a 2.0 case!? Why not correctly build your engine as a proper 2.0 - & then use the 8.0:1 CR Euro P&C's with the proper 2L heads for a little more HP & TQ out of it!? PS - the Euro 2.0 P&Cs got a factory stated 100 HP vs 91 on the USA 7.:1 CR version, & AFAIK the factory Meyle Euro P&Cs are still around, if you check with the usual sources. Then use the 2L SSI HEs & 2L Banana exhaust on that! Hi Tom! Conveniently I get to answer that I have no idea because I haven’t built it like this. This is how it came. I’m just trying to get this car happy so I can use it as is for a while before throwing anymore time or significant money at it. original poster said "2.0 case"
Hi - yes, was trying to be specific. From what I was told it’s a 2.0 L bottom end with 1.8 heads that were tailored to fit. She feels quite lively, has decent torque for whatever that’s worth. Thanks for the response by the way. Some guys prefer to use 1.8 heads for their performance engines. I have no idea if this was the case with yours. and often people will call a big bore motor a "2 liter"
This is the most likely reason for someone to have 1.8 heads on a "2 liter"
Thanks guys - great input, thanks. It is a 2.0L case, don't have the number at my finger tips, but I checked it before I bought it and it's is (or was) a proper 2.0L case and not from a Bus. Good morning - to close this out should I be looking for a matched set of 2.0l headers or heat exchangers and muffler? Thanks for all for the help yesterday, I know I was a bit rapid fire but I had the time and three cars needed attention.